The July 9 ACBS show in Gravenhurst, Ontario is racing at us. We are committed to bring Orca, my 1953 22’ Shepherd Model 110-S Sportsman. As this video portends, many a late night are in our future! But her 331 cubic inch, dual-quad-four, V-drive Hemi is on track. Robert Henkel, Robert Henkel Inc. (chris-craft-parts.com) has engaged a comprehensive tear-down and re-build that will include porting, polishing and balancing among a long list of particulars. The purple monster is on schedule and will be back and install-ready by the first week of May. And the hull? Well Mickey Dupuis, Custom Restoration, Holyoke, MA, has finished working his magic on the hardware. Shauna, Kocian Instruments, Forest Lake, MN (kocianinstruments.com), reports that the instrument cluster’s restoration will also be back by early May. Her original wheel needed a complete restoration. Once again the pros at PearlCraft, Rowville, Victoria, AU (pearlcraft.au) transformed a totally shabby wheel into jewelry. The Marmoleum is in hand, and the upholstery is in process. 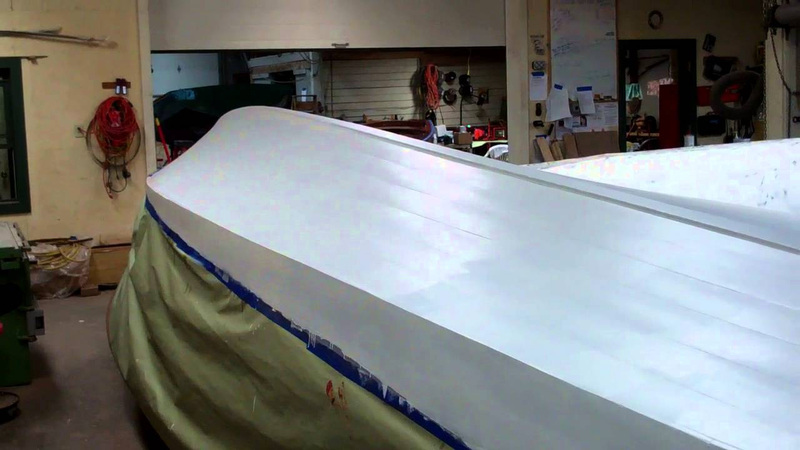 ALL that is left is finishing the hull… all..
By the end of the week we will have applied all five coats of Interlux Interprotect 2000E two-part epoxy barrier coat will have been applied. Installing the True 5200 bottom will be complete. Three coats of hard racing bronze bottom paint will follow. Then off comes the paper and out come the longboard sanders for the final topside and transom planking, followed by staining and sealing. Seems so straightforward… guess we will just let her romp on Lake Champlain in June… yes? Previous PostPrevious 1953 Shepherd Sportsman: How much 3M 5200 is enough when doing a True 5200 bottom?